The nights begin to draw out. The new year begins with a round of repairs and refurbishments. The two sequences of inscribed boat pavers in the front garden are lifted, brought inside and cleaned and repainted. Back out in place they are covered over until the garden is revealed again in spring. The lean-to shed in Julie’s garden has also needed an bit of care and attention as its windows were smashed or shifted in high winds. Gaps are filled, all is refreshed to keep it secure for another while. A general clean and tidy out of the tool store is completed – there is plenty of space to work now in colder days as all is cleared out. 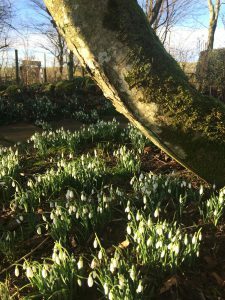 Snowdrops and aconites are flowering bringing bright little bursts of colour all around the garden and woodland and are a delight to see. Also in preparation for the coming year sweet peas and other seeds are sown under cover as plans are made for what can be placed out and planted when the season turns. 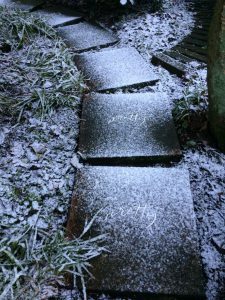 The ‘pretty’ path stones have also been repainted – and as one of the few pieces still on show all year round these take on a new seasonal significance when you come across them. Mud is packed around the Middle pond where it was leaking and also along the burn connecting from the Diana / Artemis pool – now only one area remains a problem – by the Xiape pool water is still escaping – this can only be properly investigated and repaired using the same system when the ground thaws. The old compost heap area which was cleared out has been remade as a functional space – three sections for rotation of waste – we felt it only right that these should be known to us by months in the French Revolutionary calendar – so Thermidor, Ventose, Germinal (basically hot, windy and productive) will keep us in a ready supply of compost for seasons to come. Wooden finials have been put on all the Kailyard corner posts, finishing on from the existing ones on the gate posts and more completely formalising this space. The fishing boat beehives have been repainted – Golden Gain, Sweet Promise and Bountiful – however the lettering is now badly worn and will need further attention. These, along with the lettering on the original Morris / Finlay sign on the woodshed and Reception sign need redone and will be completed in due course. The dinghy Evermore has been cleaned and holes in its keel repaired with fibreglass patches, and its partner, the rowing boat Never Enough has also been spruced up to last a little longer. 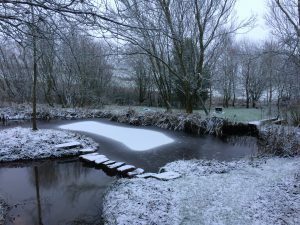 The weather has shifted from unseasonably mild at the start of the month to a more familiar cold as first snows and heavy frosts take hold. The days are bright, the sunlight sharp and low. Snow dusted trees look like negative photographs of themselves outlined against wintry skies.